The Hill Country has a number of dance halls, and some of they very famous. Here is our guide to Texas Hill Country Dance Halls, including Luckenbach. This list includes those halls currently open to the public or planned to be open to the public, and which serve the public to some degree for dancing, rental or are open to the public to view. This list also include halls that were proud and active during their heyday, but no longer are active (and are so noted where known) or that have been converted to other use (vacant, storage, residences, bar, retail space, etc.). 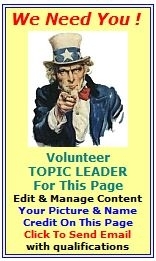 Be sure to check out the detailed profile page in this Portal site that is linked for each town to see their event calendar and more detail on fun things to do in the area. Just click on the city name above the dance hall listing. For active dance halls, it is best to check their web site or call them in advance to get the latest details for live music. There is usually a cover charge. Some of these venues have free or low cost dance lessons prior to the main band performance. Absorb the culture and music from a bygone era and today's country western music and dancing. Let the good times roll again! Hill Country Entertainment, the most comprehensive entertainment calendar in the Hill Country. >> Venues can now post live performance bookings directly, themselves, on our Live Entertainment calendar, free! ALBERT TEXAS DANCE HALL: 830-644-2042; Located at 5435 S RR-1623, Stonewall (Gillespie County), TX 78671 (postal address, but it is really in Albert TX). This is an historic building (built in 1922) that until 2010 was is in disrepair and not open to the public. However, the new Albert owners have renovated the dance hall to its former glory and it is now open. See more at: www.alberttexas.com. ANHALT HALL: 830-438-2873; 2390 Anhalt Rd, Anhalt/Spring Branch, TX 78070-3364. www.anhalthall.com. While listed in Spring Branch, it is located in historic Anhalt, in SW Comal County, N of San Antonio, 4.5 mi W of Hwy 281, just off TX 46 at 1863 intersection. (From the Hwyy 46 & Hwy 281 intersection go 4.1 miles towards Boerne, and Anhalt Road will turn to the right. Follow the road to the very end and cross the cattle guard to the gate on the left. Click for Map). Established in 1875, one of the oldest farmers' cooperative society in Texas, the Germania Farmer Verein, has met here since 1875. As a social and benevolent organization, it was organized to by German settlers for common protection against cattle rustling. See Pictures. Mayfest: 3rd Sunday in May; Summerfest: last Saturday in July, Octoberfest: 3rd Sunday in October (locally referred to as Maifest and Oktoberfest). Well-known local performers include Chris Wall and Gary P. Nunn. Newly renovated 6,000 SF hardwood dance floor. Cold beer, wine coolers, setups. You may bring snacks. No pets or coolers. Hall is available for rental. 11th STREET COWBOY BAR: 830-796-4849; 307 11th St, Bandera, TX 78003. www.11thstreetcowboybar.com. A unique cross between a neighborhood bar and the best country & western night club around. Known as the "Biggest Little Bar in Texas", has been featured on the Oprah Winfrey Show and in "Southern Living" and "Life" magazines. You can enjoy a fun-filled night with food, drinks, live country western music and dancing. They serve hot dogs, hamburgers and steaks. Many events are held here, such as the Texas Independence Day Blowout and the 11th Street Annual Mardi Gras Parade and Party. Live Music Weekends & Wednesday Steak Night. Sunday afternoon Jam Sessions. ARKEY BLUE'S SILVER DOLLAR SALOON: 830-796-8826; 308 Main St, Bandera, TX 78003. Established in 1930s. Named after Arkey Blue who is a singer, songwriter and entertainer who has been performing here since 1968. Willie Nelson and Caesare Masse have often visited. This is a unusual bar located underground and has a sawdust dancing floor. You can shoot pool, play on the Dolly Parton pinball machine, or sit down and drink a beer at the table on which Hank Williams, Sr. carved his name. Open: Daily (music Wed, Fri, Sat & Sun). Public dances. Music Fri and Sat; acoustic jam session on Sat at 3p. BLUE GENE'S COWBOY SPORTS BAR: 830-796-7144; 807 Main St, Bandera, TX 78003. www.bluegenesbandera.com. Weekend live entertainment. Live music Friday and Sat. Weekly pool tournament, Texas Hold'em competition, and open mic night. CABARET CAFE & DANCE HALL: 801 Main St, Bandera, TX 78003. Closed: This structure has been demolished. FARM COUNTRY CLUB: 210-844-8549; NW of Bandera, between Hwy 16 and Hwy 173 on FM 2828, Bandera. Turn into entrance and look for sign. Bandera Dance Club hosts live dance music by The Almost Patsy Cline Band (www.almostpatsyclineband.com) at the Farm Country Club (www.farmcc.com). Free dance lessons before each dance. Smoke-free. BYOB with ice & setups available. Fee: $15 or Membership option. Dance schedule at web site. 7p-11p. 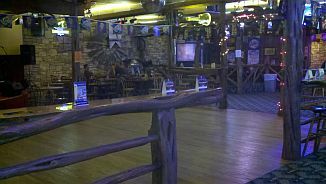 LONGHORN SALOON: 830-796-3600; 1307 Main St, Bandera, TX 78003. www.longhornsaloonbandera.com. Offers food, dancing and country western music. Live music Fri and Sat. Trail Ride Ride every Sun at noon for a ride around town. Return at 3p for guitar pickin'. All ages welcome and folks are welcome to follow trail riders and enjoy the stops along the way. Thursday Grill Night on the River. Karaoke on Tuesday and Thursday nights. Pool tournaments on Monday and Wednesday nights. No web. BLUMENTHAL DANCE HALL: Blumenthal, TX. This dance hall is no longer active. LONGHORN CAVERN DANCE HALL: Burnet, TX 78163. In the 1920s and early 1930s part of the cavern was used as a dance hall, night club, and restaurant. One of the rooms was used for theater presentations and religious services. In 1931 the state of Texas purchased the cavern and the surrounding ranchland for a state park. Located 16 miles NW of Fredericksburg in N Gillespie County on US 87 N. A farming community. CHERRY SPRINGS DANCE HALL: 17662 US 87 N, Cherry Springs, TX 78624. Circa 1889, German heritage dance hall. Currently not open for business. It is just a shell of a building now and used only for storage. From Wikipedia: "The dance hall was established along the old Pinta Trail in 1889 as a stop for cattle drives. It was originally run by Herman Lehmann, son of German immigrants, Apache captive and adopted son of Comanche chief Quanah Parker. Cited by the State of Texas Music Office as "one of the most historic dance halls in the world," the venue has played host to some of the greatest legends of country music. Hank Williams once played here, as did Patsy Cline, Buck Owens, Webb Pierce, Ernest Tubb, George Jones, and many others. It was here on October 9, 1955, that the Louisiana Hayride Tour played, with Elvis Presley, Johnny Cash and others, on the cusp of international fame for the performers. Geronimo Trevino III in his book Dance Halls and Last Calls - A History of Texas Country Music Dance Halls in Texas, 1800s-Present day likens the talent who have played there to "The history of country music." Lots of stars have performed here: Lefty Frizzell, Ernest Tubb, Buck Owens, Hank Williams, Ray Price, Faron Young, Asleep at the Wheel, Patsy Cline, George Jones, Adolph Hofner with Caesare Masse, Nat King Cole and, in 1956, even a young Elvis Presley (see link). "Ernest, one of the four creators of Honky Tonk Music (with Ted Daffan, Floyd Tillman & Al Dexter), often played at Cherry Springs due to its historical and lively atmosphere. Located on the old Pinta Trail, the Hall was originally opened as a stop for cattle drives with old adobe bunk houses in the rear. Herman Lehmann, adopted son of Comanche Chief Quanah Parker, ran the Hall for several years "til he drank too much beer, got too fat.." Owner Don Owen. (THE) FISCHER DANCE HALL: 210-935-4800; Fischer Store Rd, Fischer (Comal County), TX 78623. Just off RR 32 and FM 484, NW of Canyon Lake. "Still operated by descendants of the original family who built it (circa 1895). The town continues German pioneer pastimes with a handset nine-pin bowling alley. Several scenes from Willie Nelson's movie "Honeysuckle Rose" were filmed on location here. The interior of the Hall is an architectural wonder with beautiful old hand hewn beams and rafters. Adolph Hofner has played here many times and Ponty Bone has played several weddings." Event rentals. FREDERICKSBURG DANCE HALL (formerly PAT'S HALL): 830-997-7574; 830-998-7411; 406 Post Oak Rd, Fredricksburg, TX 78624. www.fredericksburgdancehall.com. Now owned by and operated as Providence Hall School, but available for rental as Fredericksburg Dance Hall, for dances and other events. TURNER HALLE: 830-997-2204; 103 W Travis St, Fredericksburg, TX 78624. Now a social club but open for private functions, German heritage. Established: 1871. "This club (verein) functions more often as a community center than as a Dance Hall, in contrast to Pat's Hall, which was on the other side of Fredericksburg. Over the past 125 years weddings, receptions and reunions have often been held here. Some, in recent times, have been played by up-and-coming Texas Hill Country bands." From the Governor's Texas Music web site: "Turner Hall, operated by the Fredericksburg Social Turn Verein, . . is rented for functions. We are not a nightclub. Built in 1886 on the corner of Summit Street and Upton Avenue (presently US-90), Turner Hall, constructed by Henry Bohlman, was the primary community center. Through the years the hall was the site for theatrical performances, musical concerts, social events, and seasonal celebrations." GRUENE HALL: 830-606-1281; 1281 Gruene Rd, FM 306, downtown Gruene (New Branufels). www.gruenehall.com. See Southern Living article at Dance. Built in 1878, this is a huge attraction in modern times. Texas Gernan Heritage, 75th Germania Farmer Verein. Claimed to be the "Built in 1878, Gruene Hall is the oldest continually running dance hall in Texas." Gruene Hall has hosted such acts as Willie Nelson, Lyle Lovett and George Strait. "The town was established on the Guadalupe River for the operation of the steam operated cotton gin, and by 1872 over 8000 acres were under cultivation. The Dance Hall was built by Heinrich Gruene along with a store and saloon for the local farmers. Reopened in 1979 it has inspired the entire town to be restored to its 1880s appeal. Many young Artists from all over have played this monument to Texas Music, including Jerry Jeff Walker, George Strait, Ray Wylie Hubbard, Loose Diamonds and the Sisters Morales. Only a few Halls such as Schroeder Hall, Fischer Hall and Anhalt Hall are older than Gruene Hall, one of the older Honky Tonks in the entire Lone Star State. Great music all the time.". Live bands or singers most every day of week, sometimes two per day, free unless it is a big name, sometimes two per day, varying genre. The wooden floor surface is uneven and "springy." Air conditioned, but you'd be hard-pressed to feel it. Lots of cold beer!. MAYFLOWER DANCE HALL: Rio Median, Gruene (Comal County), Gruene, TX. Circa 1909. 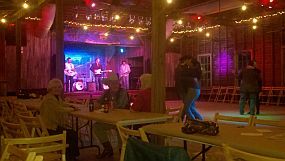 CRIDER'S RODEO, DANCE HALL & CAFE: 830-238-4441; Hwy 39 (3.5 mi W of town), Hunt, TX 78024. http://cridersrodeoanddance.com. HYE TEXAS DANCEHALL: US-290, Hye, TX 78635. Built in the early 1900s by Hiram Brown. It provided a community gathering space and was used for dances, barbeques, school plays, and political rallies for many years, and then retired. It is currently being restored and will open its doors to the public again in 2019. More details forthcoming. Location: W of Johnson City, E of Stonewall, at Hye-Albert Rd intersection, across from US Post Office. KENDALIA HALLE DANCE HALL: 210-863-1100; 1135 N FM 3351, Kendalia, TX 78027, at intersection of FM 3351 N and FM 473, S of Blanco, 7 mi W of Hwy 281. www.kendaliahalle.com. Established 1903. Kick up your heels at a 100 year old dance hall. Voted best wood floor in Texas, made of Douglas fir brought in from Oregon. Built in 1903 and renovated in the last few years. Available for dances, wedding and other events. "This beautiful Hall has a 2000 square foot hardwood dance floor which has seen plenty of boot scootin' over the years. The large Oak tree out in front had a logging chain permanently attached to it where unruly patrons would be handcuffed until sobriety returned. This historic Dance Hall still echoes from legends such as Floyd Tillman. An old Oak tree out back was bent by Indians to mark a trail years before the Hall was built. On March 28, 1997, "Live from Kendalia Halle" was recorded here." Live band and dance one Sat a month, cover charge, opens 7p serving free BBQ, music starts 8p, No BYOB. LONDON DANCE HALL: 325-475-2921; US-377, London, TX 76854. Located in Kimble County, between Junction and Mason on US-377. One of the oldest dance halls in Texas, established in late 1800's. Live music every Saturday. "A dance every Saturday for a 100 years or more," sings Johnny Bush in "The Ballad of London Hall," and Johnny wouldn't tell a lie unless he had to! The front of the Hall has a large stone fireplace, pool tables, shuffle board, and a beautiful hand-carved village scene above the bar. They've all played here---Johnny Bush (they had to enlarge the stage for his Bandoleros), Hank Thompson (1989, the year he was inducted into The Hall of Fame), Johnny Gimble, and Chris Wall." Open daily 5p, dance to live music every Sat from 9p-1a. LUCKENBACH TEXAS DANCE HALL: 830-997-3224; 1-888-311-8990; 412 Luckenbach Town Loop, Luckenbach/Stonewall (Gillespie), TX 78624. www.luckenbachtexas.com. Live music almost every day, dance band most Fri & Sat nights, from 9a-close. Light food, beer and wine available, but NO BYOB (they are very emphatic about this). Their web site tells the history of Luckenbach along with events that are happening and their favorite pickers, including Willie Nelson, Waylon Jennings, and many more. "Everybody's somebody in Luckenbach". Historic General Store, Post Office, dance hall, outdoor music venue, food stands, camping areas. Meet the cool cat Miz Kitty, the "boss" of the General Store. Dance hall: circa 1887. This location is often listed as "Fredericksburg". Dance Hall established: 1849, "Saved by Hondo" 1970. Live music almost every day, dance band most Fri & Sat nights, from 9a-close. "The history that emulated from the Engles family and down through Hondo Couch, is still felt to those who are travel the small twisting road to Luckenbach. In 1849 Minna Engle opened a Post Office-Store-Saloon out on Snail Creek. It became a trading post for Indians and a source for supplies and entertainment for the local farmers. Back in 1970 a local farmer and a bit of a sage, Hondo Crouch, was driving by and was in need of a cold beer, but the place was closed. So, he bought it. Yep, the whole darn town, Post Office, Dance Hall, and of course, the beer joint. Hondo had a special soul with a magic touch. When Jerry Jeff Walker recorded "Viva Terlingua" live in the Dance Hall a few years later, times were revived. Twenty years later Jerry Jeff Walker returned to record "Viva Luckenbach." Thanks to JJW & Susan & the Gonzos, the old Honky Tonk & store were saved and re-souled. It's as old as a beer joint gets in Texas. Hey, it's still the Heart of Texas, and Hondo gave wisdom away. He had a true soul from deep from within his heart, and you can still feel his presence. Don't miss goin' around the corner to Grapetown and the Bat tunnel for some Hill Country history. God Bless Hondo (and John Wayne)." CLEAR SPRINGS CAFE: 830-629-3777; 1692 Hwy 46, New Braunfels, TX 78130. Germania Farmer Verein. Established: 1870, "The Hill Country's Oldest Dance Hall". Elvis has been here. Restaurant: open 11a-9p. "The first store and Dance Hall was built in 1873 by Johann Andreas Breutedt and also served as a saloon and cotton storage facility. Today the old building has been beautifully restored and is a great Texas style family restaurant with a very rustic atmosphere. Occasionally musical events have showcased Steven Fromholz, Tracy Nelson, Clay Blaker, George Strait, and even Bo Diddley." CRYSTAL CHANDELIER: New Braunfels, TX 78130. www.soyoulikegeorgestrait.com. According to the web site, "The Chandelier now sits as a vacant shell on the side of the road on the north side of New Braunfels . . . only a couple of miles from Greune Hall it was a club fashioned for the new popularity of country music. It had a BIG DANCE FLOOR! One of the best dance floors in any club I saw Ace play at. Even with a big crowd you could enjoy a great dance here. Backstage was basically outside. There was a small room offstage, and then the door to outside where they parked the first bus Ace had." DEVIL'S BACKBONE TAVERN: FR 32, New Braunfels, TX 78130. Near Canyon Lake, S of Wimberley. FREIHEIT COUNTRY STORE: 830-625-9400; 2157 FM 1101 off Hwy 46 E, 3/4 miles from New Braunfels (5 minutes off I-35). Established: 1889. Open: Tue-Sat 11-2. "Humble Time Radio Show is recorded here each Saturday highlighting local unknown as well as known talent. It's a great experience to attend. Owners Shorty and Rosie Haas are a great couple worth the stop just to talk to, and it's only 5 minutes off busy I-35. Cold, cold beer and good food. Geronimo Trevino performed live here on May 24, 1997." RIVER ROAD ICE HOUSE: 830-626-1335; 1791 Hueco Springs Loop, New Braunfels, TX 78132. www.riverroadicehouse.com. Entertainment, dance hall. CLUB 281: 830-825-9900; Hwy 281, Round Mountain, (Blanco County), TX. At US 281 and FM 1431. This historic dance hall apparently is closed. CHEATHAM STREET WAREHOUSE: 512-353-3777; 119 Cheatham St, San Marcos, TX 78666. www.cheathamstreet.com. Famous bar and dance hall that launched the careers of George Strait and Stevie Ray Vaughan. Circa 1910. Public dances, medium-small dance space elevated in front of the stage. Wooden Floored. Full bar. Free live music every weekday 5:30-7:00 pm. Major bands with admission fee most Fri & Sat nights. SISTERDALE DANCEHALL & EVENT CENTER: 210-508-0344; 1210 Sisterdale Rd, Sisterdale (Kendall County), TX 78006. "The Dancehall was built between 1884 and 1890. Famous artists performed at the Sisterdale Dancehall over the years. Our Dancehall has been a movie location, and it hosted George Strait in a Bud Light commercial. Brooks and Dunn used our Dancehall while filming their classic hit song, Red Dirt Road." Wedding and special event facility. Live dance bands many Sat nights and some Fri nights. POODIE'S HILLTOP BAR & GRILL: 512-264-0318; 22308 TX 71 W, Spicewood, TX 78669. www.poodies.info "Nestled in the heart of God's country, Poodie's offers the best in Texas grub, live music and cold beer. Open seven days a week and just a short drive west of Austin, Poodie's is legendary for having the biggest names in music "dropping in." From Willie to Merle to Waylon to Billy Joe Shaver to Freddie Powers to Bobby Boyd, you just never know who will show up and sit in! Poodie has even been seen around the place on rare occasions!" Live dance bands on most Fri & Sat nights. 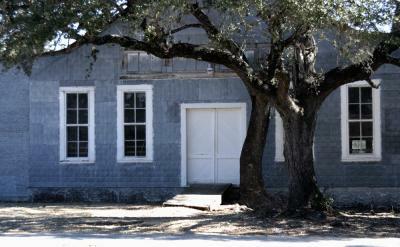 WEINHEIMER DANCE HALL: Stonewall, TX 78671. No longer active. "These old Halls echo with the great melodies of "Pappy" Selph, Cliff Bruner, Adolph Hofner, and Caesare Masse. All of them still active after over 60 years and playing better than ever! This great old hall has special dances every Christmas and New Years besides the monthly dances which always draw a good crowd. Pack up the entire family, take the scenic drive out to this historic old Hall, and discover what generations of musicians like ex-Tex Ritter's band mate Slim Roberts are singing about." WARING DANCE HALL: Hwy 1621, Waring (Kendall County), TX 78074. Includes old-time general store. www.donstrangeranch.com. Circa 1900. German heritage. NELSON CITY DANCE HALL & PARTY RANCH (& PO-PO's FAMILY RESTAURANT): 830-537-3835; 825 Hwy 289 Boerne/Welfare (Kendall County), TX 78006, just S of Welfare; 1/2 mile off IH 10 Exit #533 (Welfare Rd. Exit), NW of San Antonio By Boerne. Currently is a dance hall and restaurant (Old San Francisco Dance Hall & Saloon). Circa 1929. Open: Wed-Thur 5p-11p, Fri-Sat 4p-2a, Sun 2p-10p. "From the comforting sounds of violins and guitars to the flushing faces of happy two-steppers and waltzers. If you haven't experienced a Texas honky-tonk, then you haven't experienced Texas! For a true Texas encounter you really need to leave the city, because it's in the country where dance halls begin. They have served as the small town's courting stage, musician and singer's sounding stage and the dance lover's dream. Well, Nelson City Dancehall serves up all of these and more. Located next to an old 1929 dancehall in Nelson City, Texas, this family owned treasure is the genuine article. Promoting Texas music including Tejano, Country, Zydico, Rock'N'Roll, Blues, and Bluegrass, Nelson City Dancehall provides live music every Friday, Saturday and Sunday. Musicians enjoy playing here because of the family atmosphere and the acoustics, and as one put it, "It's the most beautiful dancehall in this part of Texas." Friday night is steak night! Dine, dance and have an excellent steak." The dance hall is booked for private parties (not for open, public dance opportunities). BRAUN HALL: 210-588-9241: 9723 Braun Rd, Helotes (NW San Antonio), TX 78250. Established: 1893. Open evert weekend with live music every Sat night. "Besides the immaculate dance floor, this Hall has a unique band stand that is a "cove" in one side wall. The dancers love it as they have even more room to twirl away. "If you're dancing', you're not dying" is the motto around this beautiful Hall which is a Hermann Sons Lodge. Besides the immaculate dance floor, this Hall has a unique band stand that is a "cove" in one side wall. The dancers love it as they have even more room to twirl away. This is one of the very few places that a person can still see Adolph Hofner performing, who first recorded in 1936. Don't miss a chance to see this great pioneer of Texas music. The Hall is primarily rented out for wedding receptions and various parties and meetings. There is a large dance floor, cash bar, and Braun Hall has a capacity of 250 people. Cover charge is usually 6 dollars. We are open till midnight and there is an in-house PA system." FLOORE'S COUNTRY STORE: 210-695-8827: 14464 Old Bandera Rd, Helotes (NW San Antonio), TX 78023. www.liveatfloores.com Established: 1886. "This historic monument to Texas Dance Hall music was a stomping ground for cattle drives and sheep herders as far back as 1886. Hank Williams, Ernest Tubb, Lefty Frizzell, Bob Wills, Ray Price, Robert Earl Keen, Johnny Gimble, Johnny Rodriguez, and many other Legends have played this great hall. In "Shotgun Willie", Willie Nelson refers to his colorful pal, original owner John T. Floore. For a while, Willie played Floore's every weekend." From the Governor's Texas Music Office web: ". . is one of the greatest dance halls in Texas. Open by John T. Floore in 1942, Floore's has three claims to fame: Willie Nelson got his start here, we have the largest patio in the South, and we have the world's best homemade bread and tamales. Floore's is a family honky tonk where kids are welcome with their parents. The dance hall is open Wednesday - Sunday with live entertainment Wednesday - Sunday." RILEY'S TAVERN: 512-392-3132; 8891 FM 1102, Hunter, TX 78132. Just NE of New Braunfels. www.rileystavern.com. Texas' First Tavern After Prohibition. Previously known as Galloway Saloon. The main part of the building has been dated around the mid-1800s. Today Riley's is still open and offering some of the best local talent around. A great place to visit. BLUE BONNET PALACE: 210-651-6702; 17630 Lookout Rd, Selma, TX 78154. Located NE of San Antonio near IH-35. www.bluebonnetpalace.com. Live dance music Fri & Sat nights, and occasional Wed & Thurs nights. Menu, and full bar. HANGAR HOTEL & CONFERENCE CENTER: 830-997-9990; 155 Airport Rd, Fredericksburg, TX 78624, www.hangarhotel.com, The Hangar Hotel was uniquely designed 50 room hotel with an exterior appearance of a WWII hangar of the romantic 1940s. The conference center and diner also reflect the style of the era and offer a great space for hosting events or simply for a weekend get-away. The conference center can seat 500 and features a customizable marquee. An additional space, The Pacific Showroom, can seat up to 250 and offers a south pacific theme complete with tiki bar and a large stage and dance floor. Small subset rooms are also available for smaller get-togethers and meetings. See our facebook page www.facebook.com/hangarhotel for pictures of recent events. HANGING TREE SALOON: 210-651-5812; 18425 2nd St, Braken, TX 78266. Located NE of San Antonio and FM 1604. www.hangintree.com. Live dance music most Fri & Sat nights. INN OF THE HILLS RESORT & CONFERENCE CENTER: 830-895-5000; 1001 Junction Hwy, Kerrville, TX 78028. http://innofthehills.com. Upscale motel, restaurant, conference facility, the Inn Pub with full bar, a small-medium dance floor & live Texas music Tue through Sat evenings. LAZY L&L HALL: 830-964-3455; 11699 River Rd, New Braunfels, TX 78130. www.lazylandl.com. OLD PEANUT MILL STEAKHOUSE: 325-347-9540; 1100 Ft. McKavitt St, Mason, TX 76856. www.myspace.com/oldpeanutmillsteakhouse. Just N of town, huge bar & dance floor, full menu, draft beer, big outdoor area. Regularly scheduled entertainment. POODIE'S HILLTOP BAR & GRILL: 512-264-0318; 22308 Hwy 71 W, Spicewood, TX. www.poodies.info. "Nestled in the heart of God's country, Poodie's offers the best in Texas grub, live music and cold beer. Open seven days a week and just a short drive W of Austin, Poodie's is legendary for having the biggest names in music "dropping in." From Willie to Merle to Waylon to Billy Joe Shaver to Freddie Powers to Bobby Boyd, you just never know who will show up and sit in! Poodie has even been seen around the place on rare occasions!". Dance area is a medium sized floor, hard surfaced. Live music Wed-Sun, with major bands Fri & Sat. SOUTH STAR DANCE HALL: 830-990-4440; 2000 U.S. Hwy 87, Fredericksburg, TX 78624 (just a mile or so south of town). Red Oak dance floor, smoking in covered beer garden only, covered patio, BBQ, good sound system, covered patio, full-bar. VFW FRANTZEN AHRENS POST 7105: 830-997-5017; 710 S. Washington, Hwy 87 South, Fredericksburg, TX. Everybody welcome. BYOB; Entertainment. Unfortunately, they allow smoking in the front area. WINERIES & OTHER LARGER VENUES: Because of the popularity and draw of CW Dancing, more businesses are hosting dance bands and often in outdoor venues. Notable ones include Torre di Pietra Winery and Wild Seed Farm near Fredericksburg on Hwy 290. See full venue descriptions above. 11th STREET COWBOY BAR: 830-796-4849; 307 11th St, Bandera, www.11thstreetcowboybar.com. A unique cross between a neighborhood bar and the best country & western night club around. Known as the "Biggest Little Bar in Texas", has been featured on the Oprah Winfrey Show and in "Southern Living" and "Life" magazines. You can enjoy a fun-filled night with food, drinks, live country western music and dancing. They serve hot dogs, hamburgers and steaks. Many events are held here, such as the Texas Independence Day Blowout and the 11th Street Annual Mardi Gras Parade and Party. Live Music Weekends & Wednesday Steak Night. Sunday afternoon Jam Sessions. ALBERT DANCE HALL: Albert, 830-644-2042, www.alberttexas.com: Most Saturdays with a name band, 7:30p opens; music starts 9-ish; Riley's BBQ. ANHALT DANCE HALL: Anhalt-Spring Branch, 830-438-2873, www.anhalthall.com: Couple of Saturdays a month, opens at 7p, live music 8-12. ARKEY BLUE'S SILVER DOLLAR SALOON: Bandera, 830-796-8826, www.arkeyblue.com. Open: Daily (music Wed, Fri, Sat & Sun). Public dances. Music Fri and Sat; acoustic jam session on Sat at 3p. BANDERA DANCE CLUB AT FARM COUNTRY CLUB: Bandera, 210-844-8549, www.almostpatsyclineband.com. Music by The Almost Patsy Cline Band. Free dance lessons before each dance. Smoke-free. BYOB with ice & setups available. Fee: $15 or Membership option. BANDERA SALOON & GRILL: 830-796-3699, Bandera, www.banderasaloon.com. Live music Wed, Fri and Sat. Restaurant. BLUE GENE's COWBOY SPORTS BAR: Bandera, 830-796-7144, www.bluegenesbandera.com. Weekend live entertainment. Live music Friday and Sat. BLUE BONNET PALACE: Selma, 210-651-6702, www.bluebonnetpalace.com: Fri & Sat nights, and occasional Wed & Thurs nights. Menu, and full bar. CHEATHAM STREET WAREHOUSE: San Marcos, 512-353-3777, www.cheathamstreet.com. Wooden Floored. Full bar. Free live music every weekday 5:30-7:00 pm. Major bands with admission fee most Fri & Sat nights. ELKS LODGE: Kerrville, 830-895-4554, www.elks2081.info: Every Wed, Dave Laughlin Band, 7-9:30p. Free, with hopeful $5/person donation. GRUENE HALL: Gruene (New Branufels), 830-606-1281, www.gruenehall.com. Live bands or singers most every day of week, sometimes two per day, free unless it is a big name, sometimes two per day, varying genre. INN OF THE HILLS: Kerrville, The Inn Pub, 830-895-6022, http://innofthehills.com: Tue through Sat evenings; full bar, happy hour and free pub grub, a small-medium dance wood floor & live Texas music. KENDALIA HALLE: Kendalia, 210-863-1100, www.kendaliahalle.com. Live band and dance one Sat a month, cover charge, opens 7p serving free BBQ, music starts 8p, No BYOB. LONDON DANCE HALL: London, 325-475-2921, www.londondancehall.com. Open daily 5p, dance to live music every Sat from 9p-1a. LONGHORN SALOON: 830-796-3600, Bandera, www.longhornsaloonbandera.com. Offers food, dancing and country western music. Live music Fri and Sat. LUCKENBACH TEXAS DANCE HALL: Stonewall, 830-997-3224; 1-888-311-8990, www.luckenbachtexas.com. Live music almost every day, dance band most Fri & Sat nights, from 9p-close. Light food, beer and wine available, but NO BYOB (they are very emphatic about this). POODIE'S HILLTOP BAR & GRILL: Spicewood, 512-264-0318, www.poodies.info. Dance area is a medium sized floor, hard surfaced. Live music Wed-Sun, with major bands Fri & Sat. SISTERDALE DANCEHALL: Sisterdale, 210-508-0344, www.sisterdaledancehall.net. Live dance bands many Sat nights and some Fri nights. TURNER HALLE: 830-997-2204; Fredericksburg, TX. Live dance music 1st Sat every month (some exceptions). See Fredericksburg Dance Club below. TWIN SISTERS DANCE HALL: Twin Sisters/Blanco, 830-833-5773, www.twinsistersdancehall.com. Dances held first Saturday every month, 9p-1a, no reservations. Beer, wine coolers, snacks, ice and set-ups are sold, BYOB food and liquor. BANDERA DANCE CLUB: 210-844-8549; Bandera. Dance music by The Almost Patsy Cline Band www.almostpatsyclineband.com at the Farm Country Club www.farmcc.com (see listing above). Free dance lessons before each dance. Smoke-free. BYOB with ice & setups available. Fee: $15 or Membership option. Dance schedule at web site. 7p-11p. LAGO VISTA COUNTRY WESTERN COUPLES DANCE CLUB: 512-267-7090; Dances at 7p, at K-Oaks Clubhouse, Lago Vista Admission: $20 - Couples Only. BYOB. Setup provided. Everyone brings snacks. MARTINEZ SOCIAL CLUB: 210-661-2422; 7791 FM 1396, San Antonio, TX 78220. In NE part of San Antonio. Fredericksburg ISD Community Education, 830-997-7182; 234 Friendship Ln, Fredericksburg, TX 78624. www.fisd.org. Beginning and Intermediate CW Dancing, taught by Rocky Roquemore. Inexpensive and very effective. Mercer Street Dance Hall: Free dance lessons on most nights before their shows. TEXAS DANCE HALL PRESERVATION: www.texasdancehall.org. Mission: Committed to saving historic Texas dance halls and the authentic music and culture that is still found in them. Lot's of great dance hall resources on this site. He is cofounder of Texas Dance Hall Preservation nonprofit and an authority on these early halls. He's documented 800+ halls in Central Texas alone and has owned or managed several dance halls. He continues research for upcoming publications about this.